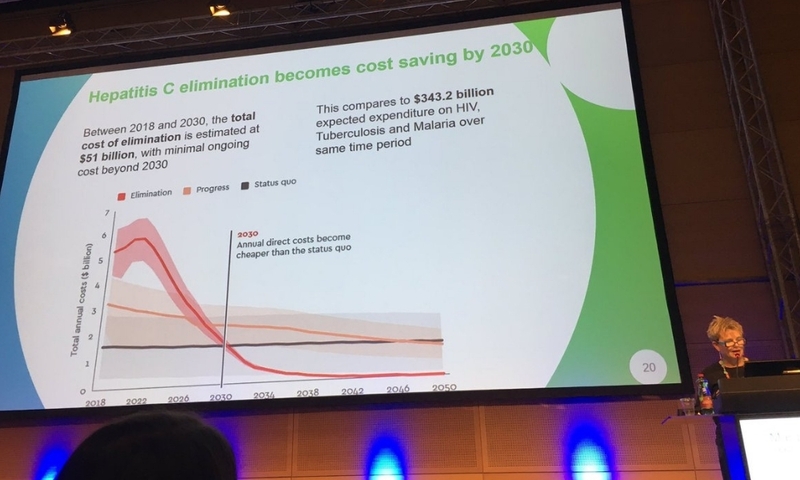 To achieve hepatitis C elimination worldwide by 2030, governments, donors and the private sector will need to spend $51 billion but eliminating hepatitis C will lead to a $19 billion economic benefit by 2030, according to a model released at The International Liver Congress in Vienna on Thursday. Hepatitis C causes around 400,000 deaths each year worldwide. The World Health Organization (WHO) set targets for hepatitis C elimination in 2015, calling on countries to diagnose 90% of cases and treat 80% of people diagnosed with hepatitis C by 2030. Investment in hepatitis C elimination is still limited and without a huge increase in funding it is unlikely that the elimination targets will be met. Only 12 countries are on course to meet the targets by 2030. To investigate what mix of interventions will be needed to achieve hepatitis C elimination and how much they might cost, Professor Margaret Hellard of the Burnet Institute, Melbourne, and researchers in Barcelona, Boston, Glasgow and Lisbon modelled the costs and health and economic benefits of scaling up diagnosis and treatment between 2018 and 2030. They found that scaling up harm reduction services, training healthcare workers, maximising screening and universal treatment of hepatitis C would cost $51 billion between 2018 and 2030. If expansion began immediately, spending would peak at $5.7 billion in 2021. Spending at this level would prevent 12 million new hepatitis C infections and avert 2.1 million deaths by 2030. This level of expenditure compares to $343 billion projected to be spent during the same period on treating HIV, tuberculosis and malaria. Whereas much of the burden of these three diseases falls on the world’s poorest countries, the burden of hepatitis C is more broadly spread. Twelve million out of 71 million people with hepatitis C live in the Middle East and north Africa and a further 12 million in south-east Asia, suggesting that domestic finance of hepatitis C elimination may be more viable if drug costs are affordable. The researchers also looked at the net economic benefit of preventing infections and deaths, both in the form of averted health costs and extra productivity as result of avoiding infection or death. They found that maximum investment in elimination would begin to become cost-saving around 2027, so that by 2030, countries would have saved $19 billion. The amount of money saved would accelerate sharply after 2030 so that by 2042 countries would have gained $150 billion in productivity and other economic benefits, more than offsetting the total cost of elimination. Slower progress towards elimination – diagnosing 45% of people with hepatitis C by 2030 – would diminish the economic benefits, but even if the elimination targets are not achieved in 2030, the model projects that countries will begin to experience gains in productivity as a result of investments after 2030. Among the economic benefits would be a reduction in catastrophic health costs, where households are destabilised by unaffordable medical bills, leading to household break up, migration and destitution. Hellard M et al.The global investment case for hepatitis C elimination. The International Liver Congress, Vienna, abstract PS-065, 2019.